Rhonda Freeman-Baraka is a multi-dimensional writer with vast experience in writing for television and film, newspapers and magazines and promotional, publicity and marketing outlets. A graduate of Talladega College with a Bachelor of Arts degree in English, Ms. Freeman-Baraka discovered a passion for journalism when she began writing an article for the city’s local newspaper, The Daily Home, earning five dollars a week to pen a column about the goings on at her college campus. That position led her to a summer internship with the newspaper where she wrote feature stories about many of the notable and colorful residents of Talladega, Alabama. Those articles earned her a first place win in a national competition staged by the National Association of Black Journalists. Ms. Ms. Freeman-Baraka was chosen out of hundreds of applicants to become the organization’s first William Monroe Trotter intern, an honor that earned her a 10-week internship at the National Leader Newspaper in Philadelphia, PA. Upon graduation from Talladega College, she landed a position at her hometown newspaper, The Tuskegee News, where she rapidly ascended the ranks to become Editor and Associate Publisher. With a keen eye towards politics and social issues, Ms. Freeman-Baraka won numerous awards from the Alabama Press Association for her investigative reports and biting editorials. After six years at the paper, she left to join her then-husband in the launching of an entertainment magazine called TAFRIJA, marking her official entry into the realm of entertainment. For nine years, she served as editor of TAFRIJA Magazine where she was the first to interview many of the biggest artists to emerge from the southeast, including Usher, Toni Braxton, Pink! and Outkast. Her interviewing style led her to a second career as a media trainer for a wide array of entertainers, among them Usher, Kelly Rowland, Solange Knowles, Outkast, and LisaRaye. After nine years of running TAFRIJA, Ms. Freeman-Baraka began to extend her brand as a freelance writer, contributing to an array of national, regional and local publications, among them Billboard Magazine, New York Daily News, Creative Loafing, Jezebel, Atlanta Magazine, Georgia Music Magazine, Upscale Magazine, the Atlanta Tribune, Request Magazine, VH1.com, and MTV.com. She has written bios for hundreds of new and established recording artists and producers from Chris Brown to T.I. Rhonda Ms. Freeman-Baraka made her foray into the film industry with the 2008 production of her film “Pastor Brown,” a family drama that has been touted as a classic and uplifting take on the prodigal son story. Directed by Rockmond Dunbar, “Pastor Brown” features an all-star cast, including Dunbar, Salli Richardson-Whitfield, Nicole Ari Parker, Keith David, Ernie Hudson, Tasha Smith, Michael Beach, Tisha Campbell-Martin and Michael B. Jordan. “Pastor Brown” won rave reviews and garnered wide viewership during its premiere on Lifetime TV in February 2013 and went on to garner six Black Reel nominations, including Outstanding Screenplay (Adapted or Original), TV Movie or Mini-series. Ms. Ms. Freeman-Baraka followed up “Pastor Brown” with a series of releases for UP! TV including “Trinity Goodheart” (Eric Benet, James Hong and Erica Gluck), “Saving Westbrook High” (Salli Richardson-Whitfield, Loretta Devine, GregAlan Williams), “My Dad’s A Soccer Mom” (Lester Speight, Wendy Raquel-Robinson, Skai Jackson), “Marry Me For Christmas” and “Marry Us For Christmas” (both starring Malinda Williams, Victoria Rowell, Carl Payne, GregAlan Williams, and Kristoff St. John). Ms. Ms. Freeman-Baraka’s first project for TV One was “To Hell And Back” (Ernie Hudson and Vanessa Bell Calloway) the 2015 drama based on the Book of Job, followed by “For the Love of Ruth” (Denise Boutte, Gary Dourdan, Loretta Devine and James Pickens Jr) inspired by the biblical story of Ruth, Naomi and Boaz. She recently wrote and directed “Merry Christmas Baby,” the fourth installment in her “Marry Me For Christmas” franchise. Her most recent projects include “The Miki Howard Story,” which garnered the largest viewership in the history of TV One, “The Secret She Kept,” her adaption of Reshonda Tate Billingsley’s best-selling novel of the same title, and A DeBarge Family biopic. In addition to being a working writer, director and producer, Ms. Freeman-Baraka has also spent considerable time teaching and speaking to aspiring writers and filmmakers. She has hosted writing workshops and served on panels at both the BronzeLens Festival, the Atlanta Pitch Summit, Get Connected and PVIFF. She also served as writing instructor at the SAE Institute in Atlanta as well as the famed Studio 11 Project in 2012 where eleven aspiring writers, directors and producers spent eleven weeks developing shorts. 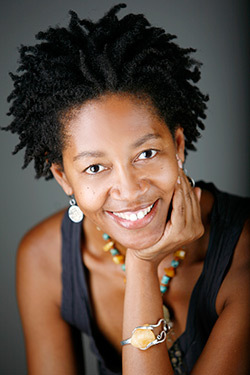 Ms. Freeman-Baraka’s most extensive work ‘in the classroom,’ however, has been sat Kennesaw State University, where she, in conjunction with The Joel A. Katz Music and Entertainment Business Program and Coles College Executive Education, launched Fade In, an eight-week writing intensive for aspiring film and television writers. The program covered the spectrum of writing for film and TV, including story, structure, character development, plot points, and dialogue and challenged writers to complete a project by the end of the eight-week period. Ms. Freeman-Baraka lives in Woodstock with her two children, Toni, 20, and Koran, 18, both students at Kennesaw State University.